Dzogchen Shri Singha of San Diego and the Dzogchen Lineage are pleased to announce that Dzogchen Khenpo Choga Rinpoche will lead the 2007/08 Dzogchen Winter Retreat with Teachings on Tummo starting December 27, 2007 and ending on January 4, 2008. This will be the first time in America that Khen Rinpoche has taught extensively on Tummo, the “practice of inner fire.” There will also be a Padmasambhava Drupchen (known in Tibetan as Rigdzin Dupa) on the final days of the retreat. The teachings will be given at our beautiful retreat facility near Eugene, Oregon. Seating is limited, so please register early. Scroll down for details. First read this entire page below and also read the Retreat Rules and Guidelines page. Everyone is welcome to register by clicking here. Sponsored and organized by Dzogchen Shri Singha of San Diego, this will be a group residential retreat with dormitory lodging and three meals a day included in the requested fees. The location will be Dzogchen Retreat Center USA, a beautiful 160 acre natural sacred land just 25 miles outside of Eugene, Oregon. To attend the retreat one has to be a non-smoker, drug-free, and mentally stable. Please read the full Retreat Details page for more information on requirements. Partial session – Unlike some previous Dzogchen Lineage retreats, partial retreats will not be possible for this retreat. Retreatants must commit to the full session and be present at all teaching sessions in order to remain in the retreat. As always the teachings and ceremonies themselves are offered free of charge. The retreat fees are used to pay for food, supplies, utilities and maintenance of the facilities. You may voluntarily make a separate offering to the teacher at anytime during the retreat. It is most auspicious to do this at the beginning of the retreat. When making your travel plans, please plan your schedule so that you arrive at the retreat center after lunch, and depart the retreat center after lunch on the dates listed above. You are welcome to come earlier or stay after the retreat to help us with preparations and clean-up of the retreat center. It is $20 per day to stay at the retreat center outside of the scheduled Winter Retreat. The $20 per day includes your meals and accommodations. Accommodations do not include blankets, sheets or towels. Because space is limited, we may have to decline some applicants, so you are encouraged to register today or as soon as possible. Registration will close on Friday, December 21, 2007. Once you register, we will contact you to confirm your registration. Everyone is welcome to register by clicking here. Please review the rules of the retreat and other details before registering. Payment is due in full at the time of registration. There will be no refunds after the close of registration. Learn more on the Retreat Payment Options Page. Tummo, or the “practice of inner fire” is a Tibetan term for an advanced type of contemplative practice with meditation. The characteristic result of the practice is intense sensations of body heat. Tummo is taught as one of the six yogas of Naropa. Eyewitness accounts abound of Tummo practitioners being able to generate sufficient heat to dry wet sheets draped around their naked bodies while sitting outside in the freezing cold. The Tummo practices were first described in writing by the Indian yogi and Buddhist scholar Naropa, although the Buddhist tradition holds that the practice was actually taught by Buddha Shakyamuni and passed down orally until the time of Naropa. One of the most famous practitioners of Tummo was perhaps the Tibetan Buddhist yogi Milarepa. Khen Rinpoche will teach on the Tummo practice as it is transmitted according to the Longchen Nyingthig and Khandro Nyingthig lineages. The retreat will also include in-depth and direct teachings by Khen Rinpoche on the sacred text The Buddha Path and he will also lead us in many practices including mantra recitation, reciting sacred text, visualizations, music making, light offerings, torma offerings, and food offerings. Drupchen is a form of Vajrayana Buddhist practice and meditational retreat. It is led by a Vajra Master and involves a large number of participants. This very powerful practice acts as an antidote to negative forces. It is known to maintain its potency when other means are becoming ineffective. This makes it an excellent remedy to all the complex problems found in today’s troubled world. There are three root sadhanas in the Longchen Nyingthig lineage: 1) Rigdzin Dupa (guru aspect), 2) Palchen Dupa (dewa aspect), and 3) Dechen Gyalmo or Queen of Great Bliss (dakini aspect). The Rigdzin Dupa constitutes the guru or lama aspect of the cycle, manifested as Guru Rinpoche (Padmasambhava), the incarnation of Buddha who founded the Nyingma school of Tibetan Buddhism. These sadhanas can be practiced individually or in groups. During this retreat we will be practicing a more elaborate Drupchen form. The retreat will include daily teachings by the Vajra Master who will also lead us in many practices including mantra recitation, reciting sacred text, visualizations, music making, light offerings, torma offerings, and food offerings. The practice requires prayers and the Drupchen mantra to be recited in by a small rotating group of retreatants for 24-hours a day around the clock. Drupchen develops personal inner peace, peace within one’s community, and world peace. Participating in a single Drupchen is said to offer the faithful practitioner the same merit and realization benefits as practicing alone for many months or even several years. The Tibetan word Drupchen has been translated into English as both "great accomplishment" and "great practice." In Tibet, the holding of a Drupchen is seen as a major event. Local people pool their resources to finance this form of practice, and in doing so achieve great merit. In order to finance our Drupchen at the Dzogchen Winter Retreat, the organizers will need to raise $5,000 to purchase offerings, torma, drums, sacred clothes, and other ritual supplies. Even if you will not be able to attend this retreat, you or anyone else you know may earn tremendous merit by donating to the Drupchen Fund. If you would like to contribute to the Drupchen Fund, please contact us. Realizing the true nature of one’s mind depends on accumulating an incredible amount of merit. In practicing generosity by supporting this Drupchen, one can joyously transform one’s financial resources into merit. For a $20 donation the retreatants will pray for an individual of your choice. Your loved one's name will be written on the back of a printed color double-dorje that will be a integral part of the sacred mandala shrine during the Drupchen. Please donate now with an ATM or credit card by visiting our Payment Options page and clicking on the Donate button. Providing immediate assistance will help facilitate preparations for the Drupchen in time for Winter Retreat. If you would like to help or would like more information, please contact event director Chris Carelli at ccarelli@gmail.com or 619-806-9541. Even if you will not be able to attend this retreat, you or anyone else you know may earn tremendous merit by providing facilities for those on retreat. If you would like to contribute financially or with labor, contact us immediately. There are a variety of different projects underway intended to support the retreat experience, including an awning for the shrine tent, finishing the dormitory, and refinements of the kitchen and dining areas. 1) Come to the retreat center and get the unique benefits of a work retreat. 2) Offer donations for raw materials and supplies. 3) Sponsor students and volunteers who want to perform work retreats. Daily, on an individual basis, of which we recommend 15 minutes or so of the Main Prayer, and the Supplemental section when time and positive conditions permit. Weekly, with your Sangha, whenever you get together for practice. Lastly, on the full moon. Try to plan accordingly within your Sangha and get together to practice for all beings! Khenpo has stressed that for the benefit of all beings it is imperative we generate the positive energy necessary to organize and plan a successful six-month Dzogchen Lineage Internship. Without such success, it will be much more difficult to train teachers for this world and preserve the Buddha’s teachings. We therefore encourage you to practice this prayer, the "Preliminary Practice" in The Buddha Path, and Visualization of Buddha Shakyamuni as much as possible for the benefit of all beings! Always know that your positive practice is the root of all beneficial activities and the root of world peace! Registration for the six-month Dzogchen Lineage Internship at the Dzogchen Retreat Center is now open. You can find out more and apply to attend here. We rejoice in your good practice! A vibrant and dynamic teacher, Khenpo Choga is a 33rd-generation lineage holder of the Buddhist wisdom lineage of Dzogchen, a lama of Dzogchen Monastery, and professor of the Dzogchen Shri Singha University. Khen Rinpoche has more than seven years of solitary cave meditation experience in the high Tibetan holy mountains and embodies the qualities of a realized practitioner and yogi. He is a published author of numerous Tibetan and English books, including The Buddha Path, a practice book that encompasses all of Buddha's teachings, and which is now available in English, and is soon to be released in Spanish, Chinese, and Russian. For the peace and happiness of all beings, the Dzogchen Shri Singha Foundation USA is asking for your support to ensure the future of the Dzogchen Retreat Center USA, under the spiritual guidance of Dzogchen Khenpo Choga Rinpoche. Your help is urgently needed to ensure the preservation, practice, and transmission of the unbroken Dzogchen Lineage tradition for increasing personal happiness and creating lasting world peace. Please visit our website where you can donate online and join our ongoing giving program, the Circle of Compassion, or make a one-time donation to the Dzogchen Retreat Center USA Project. "Generosity is the root of wealth and prosperity." 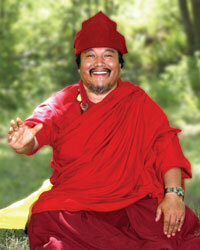 The Dzogchen Shri Singha Foundation USA is an IRS 501(c)(3) non-profit organization.